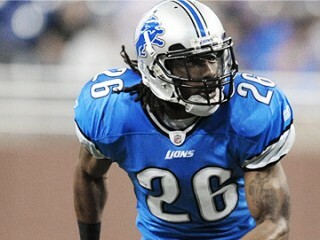 Louis Delmas is an American football safety that plays for the Detroit Lions. 2010: Team’s starting free safety. Leads team with 71 tackles (53 solo) and has 2.0 sacks (12 yards), 2 fumble recoveries and 2 forced fumbles on the season. * Finished season opener at Chicago (9/12) second among defensive players with 8 solo tackles and recorded his first career forced fumble. * Finished second on defense with 7 tackles (6 solo), including a tackle-for-loss, vs. Philadelphia (9/19). Also added his second career sack for a loss of 5 yards and 2 quarterback hurries. * Recorded 4 tackles (3 solo) and his second-career fumble recovery at Minnesota (9/26) on third-and-12 at the Detroit 26-yard line in the third quarter. * Led the team with six tackles (5 solo), including 1.0 sack for 7 yards and a quarterback hit at Green Bay (10/3). * Compiled 8 tackles (5 solo) vs. St. Louis (10/10). * Added 8 tackles (4 solo) at New York Giants (10/17). * Forced and recovered a fumble that led to a Lions touchdown in the third quarter against the New York Jets (11/7). Also, added seven tackles (5 solo). * Four tackles (1 solo) and quarterback hit at Buffalo (11/14). * Had four tackles (4 solo) at Dallas (11/21). * Recorded four tackles (3 solo) against New England (11/25). * Compiled seven tackles (5 solo) and had one pass defense against Chicago (12/5). 2009: One of the NFL’s top defensive rookies. On the season, Delmas recorded 91 tackles (63 solo), eight passes defensed, two interceptions, a safety, one fumble recovery, four special teams tackles and two defensive touchdowns (INT-TD and FR-TD). Delmas scored more defensive points than any rookie in the NFL in 2009 and ranks third overall in that category with 14 points (one Int-TD, one Fum-TD, one safety). His 14 defensive points in a season ranked second all-time in team history. Only third rookie in Lions history to record two defensive touchdowns (Lem Barney, three in 1967; LB Wayne Walker, two in 1958) and the first to do so in 42 years. All three defensive scores have occurred against playoff teams (New Orleans, Green Bay, Arizona). His 91 tackles ranked second on the team. Was named Defensive Rookie of the Month for September and nominated for same award in November. Ranked first among rookie defensive backs and third among all rookies with 94 tackles (65 solo) (including special teams tackles) according to NFL.com rankings. * Started at FS in season opener at New Orleans (9/13) and notched 6 solo stops, 1 pass defense and returned a fumble for a 65-yard touchdown. The last time a Lions defensive player returned a fumble for a touchdown was S Daniel Bullocks' 44-yarder last season vs. Tampa Bay. * Recorded 6 tackles (4 solo) and a pass defense vs. Minnesota (9/20). * Recorded first career sack for a loss of two yards at Chicago (10/4) and added 3 tackles (2 solo) and a special teams tackle. * Recorded a career high 9 tackles (7 solo), including a tackle for loss, at Green Bay (10/18). * Notched career first interception at Seattle (11/8) for 29 yards which set up a Lions’ touchdown. Also added five tackles (3 solo) and a career-high two pass defenses. * Missed game at Minnesota (11/15) due to a tooth infection that got acutely worse during pregame warm-ups. * Returned to the starting lineup and made eight tackles (six solo) vs. Cleveland (11/22). * Scored first career safety while making 6 tackles (4 solo) against Green Bay (11/26). In doing so, he became the first Lions’ rookie to score a safety since George Jamison (10/25/87). * First Lions player since S Bennie Blades in 1995 to record a safety and interception in the same season. Delmas and Blades are the only Lions players to record a pick and a safety in the same season since 1967. * First player since DE Tracy Scroggins in 1997 to record a safety and a fumble return for a touchdown in a season. * Set a career-high as he led the team with 10 tackles (5 solo) at Cincinnati (12/6). * Left the game with an ankle injury in the first half at Baltimore (12/13) after making two tackles. * Returned an interception 101 yards for a touchdown (longest in the NFL in 2009) while also contributing eight tackles (three solo) vs. Arizona (12/20). * The 101-yard interception return is the longest by a Lions' rookie in team history, is tied for the second longest in team history and is the fourth 100-yard interception return ever by a Lions player. * With his 101-yard interception return for a touchdown vs. Arizona, Delmas became the first rookie in NFL history to register an interception return for a touchdown (100t vs. Arizona 12/20/09), a safety (vs. Green Bay 11/26/09) and a fumble return for a touchdown (65t at New Orleans 9/13/09) in the same season. He is only the second player in NFL history to accomplish the feat (L.A. Rams LB Rod Martin in 1984). * His 101-yard interception return is the second longest in NFL history (considered longest in modern NFL history) by a rookie since Columbus B Pete Barnum (102 yards) vs. Canton September 26, 1926. * Registered seven tackles (five solo) including one tackle-for-loss at San Francisco (12/27). * Made five stops (four solo) including one behind the line-of-scrimmage as well as a pass defensed vs. Chicago (1/3). Selected in the second round (33rd overall) of the 2009 NFL Draft out of Western Michigan, Delmas brings athleticism and toughness to the Lions' defensive backfield. In 2008, Delmas led the Broncos with a career-high 111 tackles (61 solo) as he earned All-American status for the first time. He also had four interceptions, including one that he returned for a touchdown. His 111 hits ranked sixth among the nation's defensive backs during his final season. Delmas started in 44 of 45 games, 33 at free safety and 11 at cornerback as he began his career as a left cornerback before moving inside to free safety as a sophomore. He became just the 14th player in school history to register 300 or more tackles in a career, finishing tied for eighth on that record list with 310 hits. In addition to his stellar performances on defense, he also appeared on special teams and saw brief action as a receiver in the 2008 Texas Bowl. 2008: Started all 13 games at free safety, leading the team with a career-high 111 tackles (61 solos), adding four stops for losses totaling 7 yards and recovered one fumble and deflected three passes. * All-American Dream Team choice by The NFL Draft Report, adding All-MAC first-team honors from the league's coaches. * Earned MAC Defensive Player of the Week honors vs. Northern Illinois and Illinois. * Gained 98 yards with a touchdown on four interception returns. * Made 24 of his tackles on third- or fourth-down plays. * Had at least 10 tackles in a game six times. * Intercepted a pass in each of the team's first three games. 2007: Started nine of 10 games he played in, recording 64 tackles (48 solos), which ranked fifth on the team. * Earned All-MAC second-team honors. * Added an 8-yard sack with three stops for losses of 12 yards and posted his only college quarterback pressure in the Eastern Michigan clash. * The Intercepted one pass and deflected two others. * Gained 162 yards on seven kick-off returns. * Freshman All-American second-team selection by College Football News. * Added All-MAC second-team honors, as the true freshman. * Deflected a team-high eight passes and also paced the Broncos with three interceptions. * Had at least 10 tackles in four contests. Attended North Miami Beach (Fla.) High School, where he was teammates with fellow Western Michigan players Daniel Marks and E.J. Biggers. Utilized as a cornerback, strong safety, wide receiver, kick returner and long snapper. * Coaches 8-10 year-olds in Optimist football. * Brother Greg Joseph,plays safety at Florida Atlantic. * Born April 12, 1987 in Fort Pierce, Florida. * Resides in North Miami Beach, Florida. * The three-year starter was voted his team's best defensive back three straight seasons. * Broke school records for single game and career kickoff return yardage, as he collected 178 tackles with three interceptions on defense and had 61 receptions for 841 yards and seven touchdowns on offense. View the full website biography of Louis Delmas.